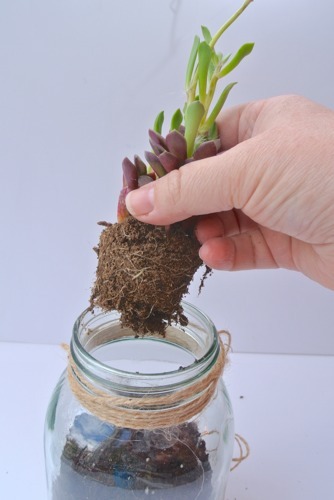 This post on making a hanging succulent garden/terrarium originally posted on One Project Closer in April 2014. Constructing the terrarium (or garden, as us not-s0-fancy non-gardeners like to say) was the easy part! I gathered my supplies and got to work at my dining room table. I used some paper Ethan had left over from laying hardwood floors in order to protect the table. It’s not such a pretty color, but it does the job. 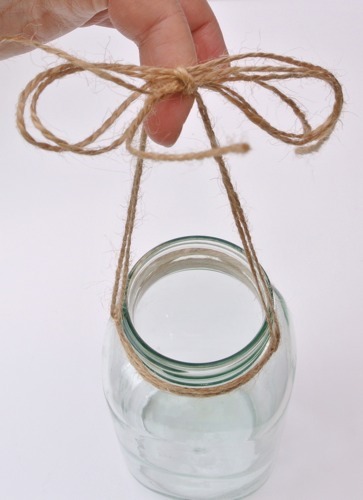 I first grabbed a large Ball Jar / mason canning jar I had on hand and wrapped the top with twine so that eventually I had two long strands hanging off opposing sides. Then I tied the two sides above in a knot, then bow. Then I started to layer my garden! woot woot. First, I placed A LOT of spanish moss at the bottom. Not sure it was needed, but it certainly looked pretty! Second, I added some rocks. 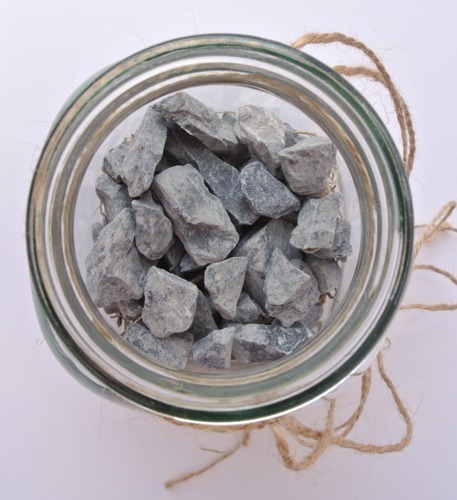 Really any rocks would do, so I used some I found in our back yard! lol. Third, I added a loose layer of soil. The soil needs to be loose in order for water to drain through it, since succulents require little water. 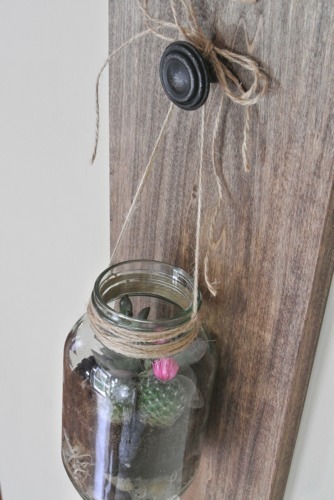 Once I finished with the mason jar, I started on the wooden hanger. It was super simple and a project that I could handle without the assistance of the hubby. lol. Did you now Home Depot will cut your wood for you? How cool is that? 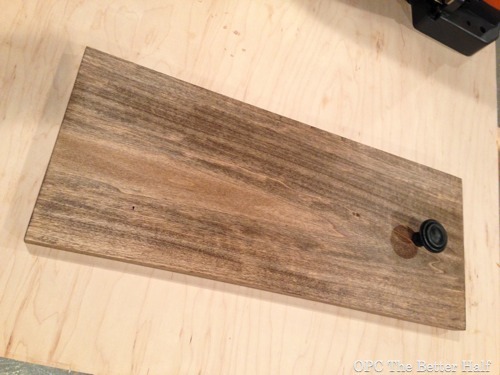 I picked out a piece of 1×10″ poplar and asked a guy in an orange apron to cut it down for me to 18″. 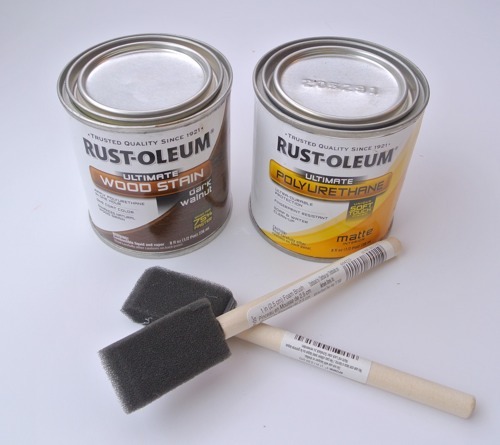 It was super cheap – I think I only spent $2 or 3 on the wood. Once home, I sanded the edges to remove any fraying and then I drilled a centered hole about 3 inches from the top for the knob. Then I stained it with Rust-Oleum’s Dark Walnut and finished it with Matte Polyurthane. Once completely dry, I finally screwed on the knob! I couldn’t figure out exactly where to hang it and Kim had asked me to throw some succulents her way, so I headed over to her house to hang it (and take loads of pix). What do you think? Is your thumb green or black (like mine)? 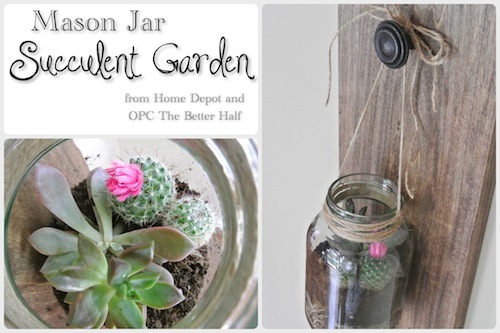 Thanks so much for all the support you showed over at my guest post on the Apron and for sharing in my love of mason jar succulent gardens! Also, stay tuned for more succulent garden ideas later this week. I’ve definitely got a black thumb. I signed up for the workshop in Westminster because I can’t make it to the EC location where you will be. I know you’ll do great. 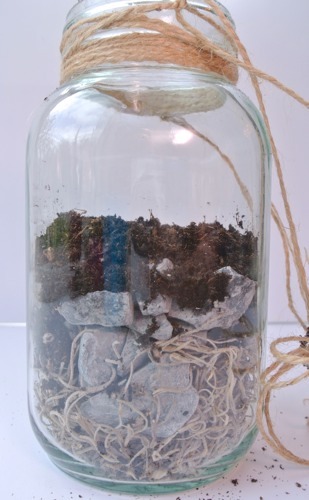 I love the idea you have of making a hanging terrarium. 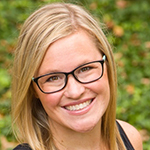 So beautiful, Jocie! Bummer you can’t make it to EC, but so glad you can still go! Are you going to Lucketts?? I love this idea. I already have the bottles, but they are pretty easy to come by at thrift stores. There’s a spaghetti sauce that comes in great mason type jars if you use pre-made sauces. Classico is the one I’m thinking of, but when I bought one for the jar I noticed there are other brands that look like the jars maybe mason type jars also. Clasico jars come in different sizes. I love your hanging garden, Jocie. I am the enemy of living plants everywhere, but I’ve really been wanting to try the succulent gardens. Say a little prayer for the local HD’s cactus- ha! I love this! 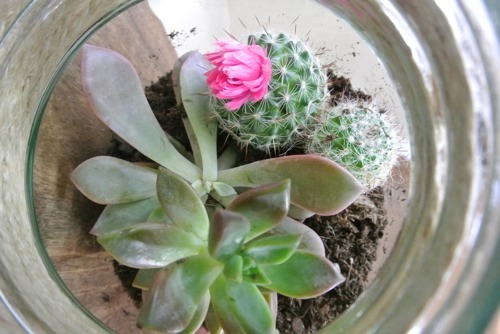 In fact, I’m going to run out and buy succulents and make little versions of this for May Day tomorrow! I have a total black thumb but I absolutely LOVE your little hanging succulent garden and can’t wait to make one of my own! 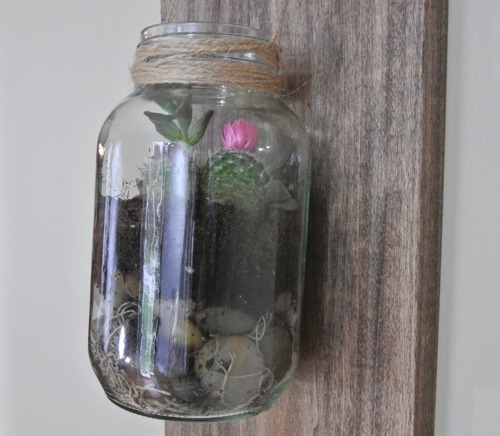 I jsut love your succulent Mason jar sooo much, Jocie. Jocie, this is so darn cute! I love it! 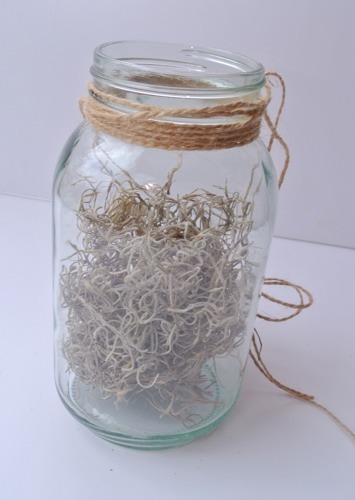 I just picked up some small succulents today from Lowes, I may have to do the mason jar like you did. SO CUTE! I just love succulents any way I can get them! I’d love for you to come link up this and some of your other projects at my new party! streamcomplet is a good site Film Streaming !